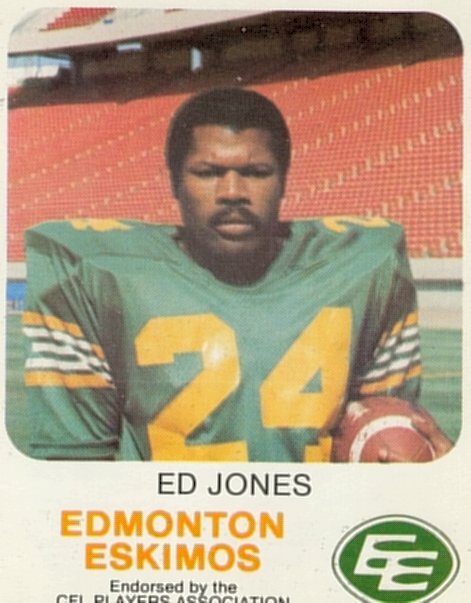 Ed Jones played nine seasons in the CFL (1976-84) as a defensivive back, eight of them with Edmonton. As a member of the Eskimos, Jones played on the team that won five consecutive Grey Cups from 1978 to 1982. Jones won four West All-Stars (1978, 1979, 1980 and 1981) as well as three CFL All-Stars (1979, 1980 and 1981). Jones' best season was 1980 when his 10 interceptions led the CFL and he returned 3 of them for touchdowns. Jones finished with a total of 31 career interceptions and 5 fumble recoveries. Jones finished his career in 1984, playing with the BC Lions.